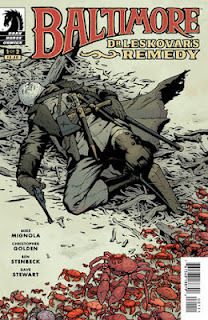 The Fellowship was fortunate enough to obtain a copy of BALTIMORE: DR. LESKOVAR’S REMEDY #1 from Image Comics. Mike Mignola and Christopher Golden write, and Ben Stenbeck draws. Bjelogoram is a small fishing village with a problem. And then Lord Baltimore’s plane crashes into it, leaving the villagers rather puzzled. But Baltimore decides to help them since he’s there anyway and the problem is right up his alley: a local scientist is working on a cure for vampirism. When he meets Dr. Leskovar, though, things get interesting. This book is set in the grip of the Great War (which adds perspective to the plane crash), and it really gives off a sense of Lovecraftian style (with a dash of Indiana Jones as well). The art contains lots of shadows and lots of blues and greens, adding to the supernatural sensibility of the story. Combine it all with the cliffhanger that the writers leave us with at the end and it makes for a really fun ride. This issue is the first of a two-parter, and I already wish it was longer. Now I’ll just have to go back and find the rest of the Baltimore series. I’m sure it will be worth the trouble. BALTIMORE: DR. LESKOVAR’S REMEDY #1 is available now at your FLCS or by order from darkhorse.com.